Sharon Saline, Psy.D., maintains a busy psychotherapy practice working with children, teens, families and adults with ADHD and other mental health issues. She has spoken and conducted workshops nationally and internationally on ADHD and the adolescent brain. Thousands of parents, teachers, school administrators and mental health clinicians have attended her presentations, trainings and workshops. “We have many effective treatments and strategies to help kids with ADHD better manage daily life, but this book will provide that equally important intervention: feeling understood. I love how this book helps parents create a deeper relationship with their kids so that the whole family can thrive." "This book is a treasure trove for any parent of a child diagnosed with ADHD. I will return to it over and over, as a parent, a teacher and a fellow-sufferer of ‘bullet brain.’"
"This book is a gift for ADHD kids and their parents, packed full of wisdom and practical tips from kids and adults alike. The five C's are tools I use and teach in my own practice all the time." 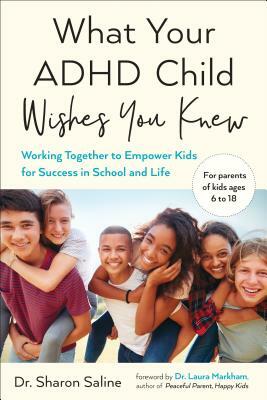 "Essential reading for parents and teachers who want to help ADHD children succeed. Dr. Saline expertly captures the voices of youth describing the multi-faceted challenge of ADHD, while providing practical, and research-tested strategies to support their learning, problem solving and relationships." "Saline’s prescription is simple, easily adopted, and highly convincing."